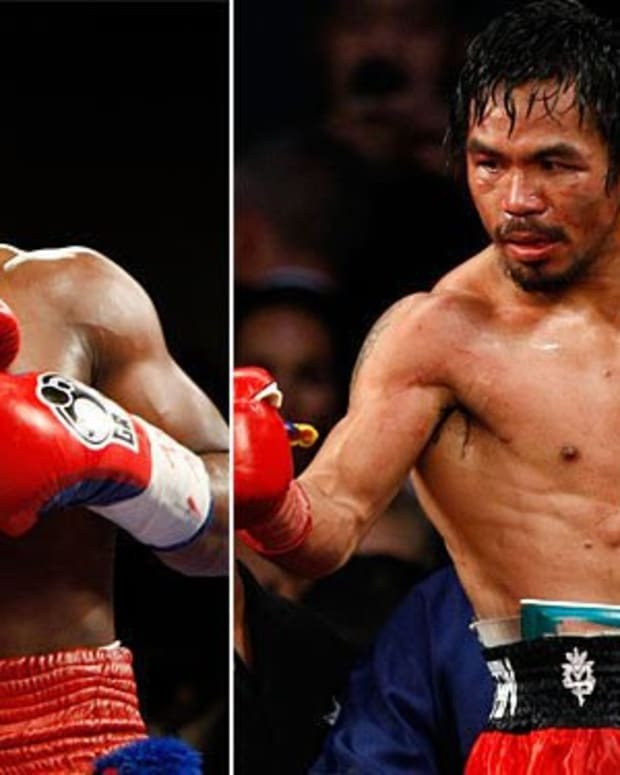 Manny Pacquiao made headlines last week when he went on record promising Floyd Mayweather Jr. the majority of the fight purse in the event of a Dream Match. Seeing as purse split has constantly been mentioned over the past two years as one of the two major stumbling blocks preventing this bout from happening, naturally, folks got excited. Maybe that excitement was a bit premature. This past Thursday, while promoting his upcoming Dec. 8 showdown versus Juan Manuel Marquez, Pacquiao looked ahead to a possible fight against Mayweather and acknowledged that he would have to make some sacrifices. Having already more or less agreed to the stringent drug-testing that Mayweather has been harping about ever since talks started, the only thing left to work out was how the fight purse would be divided. In the past, the Filipino champion was adamant about his refusal to accept anything less than 50-50. (Except for that one time when he promised Mayweather the lion’s share and then backtracked.) Last week, however, for whatever reason, Pacquiao changed his mind and made it clear that he would settle for 55-45. “Manny Pacquiao can’t tell Floyd Mayweather [expletive],” Leonard Ellerbe said. Ellerbe assessed Pacquiao’s mention of Mayweather Jr. this week on a promotional tour to Los Angeles, New York, ESPN studios and Mexico City as an “amateurish, transparent” way to promote the Filipino superstar’s fourth bout against Mexico’s Juan Manuel Marquez on Dec. 8 at MGM Grand in Las Vegas. Look, obviously Pacquiao is just doing this to hype up his Marquez fight. Nobody is disputing that. Mayweather did the same thing when he was doing press for his Victor Ortiz and Miguel Cotto bouts. It’s all part of the game. But the fact that Manny’s intentions aren’t one hundred percent pure doesn’t take away from the fact that he’s publicly agreeing to take less money. There’s no backtracking from that. Mayweather’s advisors can say what they want, but they don’t make up his mind for him. There will be more jawing back and forth between the two camps because, well, it’s what they do. At the end of the day, though, Mayweather will agree to this. He’s too smart of a businessman and too aware of his legacy not to. Manny Pacquiao Doesn’t Want to Fight Floyd Mayweather Anymore?